SET IN 24 ACRES AND IDEAL FOR VISITING GLASTONBURY WELLS AND BATH Located on the southern slopes of the Mendip Hills in a designated Area of Outstanding Natural Beauty this beautifully renovated stone and brick barn has been equipped to a high standard. Situated in the grounds of the owner s impressive home with fantastic views and surroundings you will be perfectly positioned for a relaxing holiday with footpaths leading almost from your front door. Excellent for walkers cyclists and lovers of nature yet only 3 miles from England s smallest city historic medieval Wells with its beautiful cathedral and the world famous Wookey Hole Caves. Within easy reach are Cheddar Gorge and caves Glastonbury Abbey and Tor and the wonderful Georgian World Heritage city of Bath. The Chew Valley Lakes and North Somerset coast with a range of beaches from which to choose are easily accessible. There are several historic houses to visit close by including Monatcute House Tyntesfield Stourhead and Longleat. The property offers contemporary styled accommodation with under floor heating throughout and comprises of TWO bedrooms: 1 king-size double with en-suite bathroom with shower over bath and WC 1 zip-and-link king which can be made into twin beds on request with en-suite wet room shower and WC. Lounge/kitchen/diner: open-plan with jewel coloured furniture. 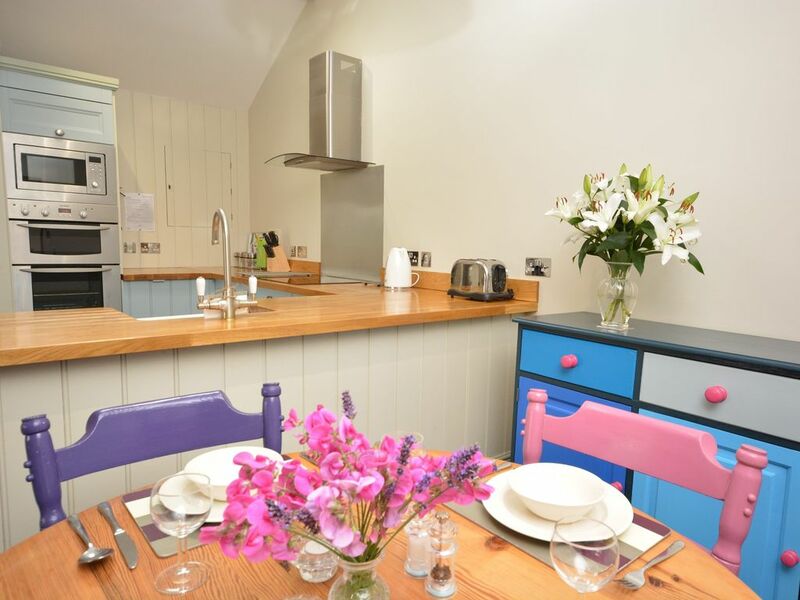 Kitchen area well-equipped with fridge/freezer dishwasher electric cooker induction hob microwave TV/DVD DAB radio CD and iPod dock. Utility room: with washer/dryer. Outside: tri-folding doors from the lounge area opens out onto a raised deck area with steps down to an enclosed garden with garden furniture and BBQ. Amenities: ample parking. Bed linen towels electric heating and Free WiFi included. 1 well-behaved dog welcome. Additional info: private natural water supply (borehole) regularly tested. Location: beach 17 miles pub 1.5 miles shops pubs and restaurants in Wells (3mls). Any property identified with increased accessibility may have different levels of provision it is therefore advisable you contact us before you book to ensure the property meets your specific needs and requirements.